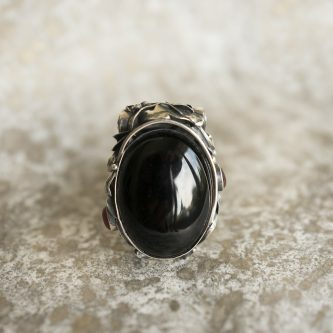 Obsidian, a powerful centering and grounding stone, clears negative physical karma. It helps the wearer disconnect from harmful habits and increases productivity and creative manifestation. It helps one to find their true Self, and to differentiate oneself from the expectations and judgements of others. It heals grief, absorbs physical and emotional pain, and minimizes addictive behavior (especially sexual and food related). Obsidian opens your inner vision, helping you know what you need to do in order to heal. Physically, Obsidian aids in the regeneration of tissues and nerves; and clears infections.